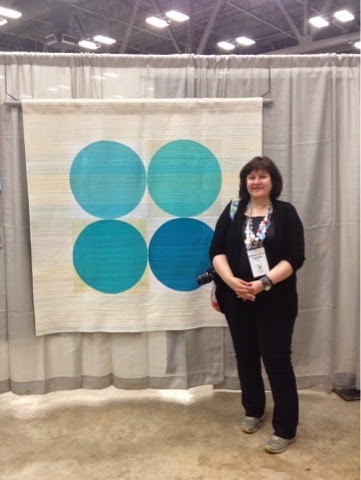 I'm having a great time in Austin, Texas at Quilt Con. I spent the day catching up with old friends, meeting new friends and attending several lectures. I had a brief walk through the show and just a quick look at all the vendors. 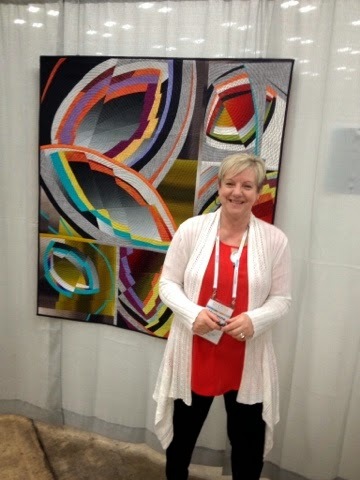 It was exciting to see my quilt in the show....sort of fun hearing some of the remarks!!! Lots of fun,actually. The trip started with me getting up at 3 am in the morning and meeting Leanne (She Can Quilt) at the airport. 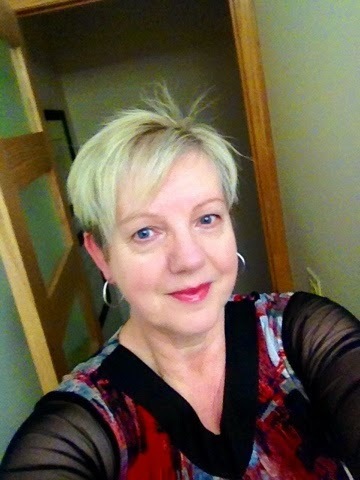 That early morning thing should account for the goofy look on my face. Trust me I am NOT a morning person. 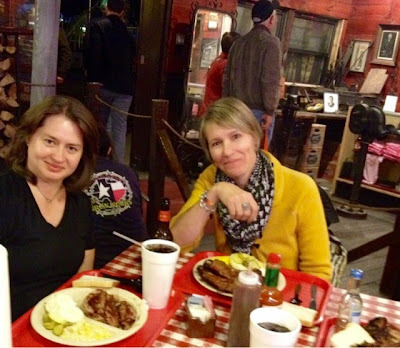 Dinner out with new friends (Christine and Stephanie). And guess who won first prize in the minimalist category??? Leanne (She Can Quilt) This picture does not do this lovely quilt justice. Congrats, Leanne!!!! Tomorrow I have much more time to go through the show more thoroughly. The quilts are amazing. I'll keep you posted!!! YOU LOOK GREAT AND SO DOES YOUR QUILT!!! I HOPE YOU ARE HAVING A BLAST!!! Wonderful! thanks for sharing and I love your quilt and Leannes!! Thanks for sharing! Your quilt looks lovely (and so does Leanne's). Seeing your quilt displayed must be very satisfying and I hope you receive the recognition you.deserve! Best of Luck! how fun! I need more quilt con photos! Hi!!!! Thanks for the pics!!!!! Glad to see you are having fun!!!!! Your quilt is awesome!!!!! Oh wow - I was at QuiltCon today, and saw your quilt, which looked fabulous ! Congratulations! Would have loved to meet you, enjoy Austin! I hoped to get to meet you at Quiltcon yesterday, but did get to see your Quilt. One of a kind! It was really unique among many stunning modern quilts. This was a much better show than 2 years ago! Thank you, I would have loved to meet you as well, i was in an all day workshop yesterday. I really enjoyed the show, so many amazing quilts. I saw your quilt there, it was one of my favorites. In fact I put a picture of it on my blog, didn't know who made it, then found out while reading bloglovin. It is a wonderful piece of art ! I'm just thrilled I got to meet you at QuiltCon. Wish we could have spent a bit more time together. Your quilt in the show was amazing and I was glad to have the chance to see your work in person. Very impressed as I knew I would be. Hope you're home safe and sound and rested. Glad to hear you had a great time at QuiltCon. Your Shifting Impressions quilt is simply gorgeous. I enjoyed reading your process post. How nice that you got to meet up with Christine, Stephanie and Leanne! Mari, you knocked this one out of the park!!! Unbelievable, truly. I've been perusing many of the quilt con pics. Can't believe yours did not win anything. Love your interpretation. I sure wish I could take a class with you. I miss you already! Loved seeing you and your quilt at the show. Same here.....you really do give the best hugs. LOVE your quilt! You have a such way with color. Very inspiring! I had seen your quilt on your blog, but seeing it in person at QuiltCon really proved how beautiful it is. It's really quite a work of art, and I love it! I recently discovered your work and can't get enough of it. Your work is my favorite of all the blogs I visit. I am absolutely taken by your work and the way you relate to the fabric. Thank you for sharing your time, talent and work. Have you considered writing a book?